The market is saturated with LED companies offering “white light” LED products. Many growers associate white LED light with a sunlight or daylight spectrum i.e. a replica of the light provided by the Sun. While it can be so, spectra appearing white to human eyes can differ greatly and thus induce entirely different responses on plants. This is dependent on their spectral compositions and the corresponding photoreceptors in plants. Some differentiation among white light spectra also occurs through different color temperatures (cool white, warm white, neutral white) or the difference perceived may be subjective depending on how sensitive people’s eyes are to notice these differences. The only way to definitively understand the DNA of light is by making measurements with spectrometers, which show the spectrum graph and photon distribution, as even spectra with same color temperature can have different spectrum graphs! Using spectrometer data makes it easy to calculate parameters related to plant growth and plant development and allows the spectra comparison of the given white LED spectrum against measurements taken outdoors. Plants absorb photon energy from the light and convert it into chemical energy in the process called photosynthesis. Furthermore, the light transmits signals to the plant about its immediate environment. Plants adapt their morphology and induce developmental processes such as flowering according to the light spectrum composition. For instance, the amount of green light in the spectrum will induce responses in plants such as stomatal closure, some shade avoidance symptoms, mitigation responses to blue light, signaling of competition from neighboring plants but also enhancing of photosynthesis by bringing the light into deeper cell layers. Additionally, it is exactly this green portion of the light spectrum which will make it appear white to human eyes. And this is also the answer to question why most LED grow lights appear pink: they do not contain the green portion of the spectrum but typically only red and blue, giving them their signature pink hue. The amount of green light will determine how white the spectrum will appear and all other color regions of the spectrum (blue, red, far-red) can differ in their proportion. This is the reason why plants can have different performances under different white light spectra, all of which appear identical to human eyes. A more detailed overview of how plants respond to different spectrum wavelengths can be found in many publications ( Kami et al. 2010; Olle and Viršilė 2013; Demotes-Mainard et al. 2016; Bantis et al. 2018). Following are some results of model plant trials conducted at Valoya. All the spectra used appeared white to human eyes but vary in spectra composition greatly, ranging from 370 to 780nm, meaning they have different amounts of UV, blue, green, red and far-red light. Parameters tested: biomass accumulation, plant height and flower induction. Biomass accumulation of Arabidopsis thaliana differs greatly under different white spectra (figure 1). 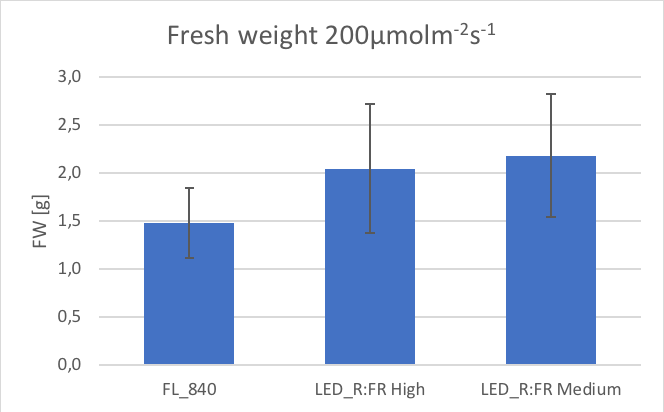 Growth under light sources created for human use such as fluorescent light (FL_840) or cool white LEDs (LED_CW) is inferior to the growth under other treatments. The treatments named LED_R:FR Low, Medium or High are altered Valoya white spectra. 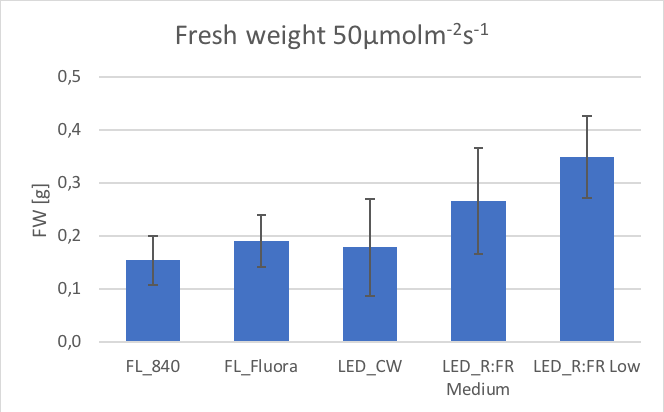 Spectra composition of LED_R:FR Low and Medium are white appearing spectra adapted for plant growth, whereas the spectrum of LED_R:FR High was specifically designed to be a highly accurate match to daylight conditions. Why does light that appears to be the same elicit such different responses. The answer is in spectrum and the balance of various wavelengths within it. In developing a spectrum an LED company has to test various red-to-far-red and blue-to-green light ratios, amounts of each color in the spectrum, the height and width of the light peaks etc. Then only through experimentation can we learn what works and what does not. Finding a concrete answer how the spectrum was balanced might be futile as LED companies protect this data, naturally. 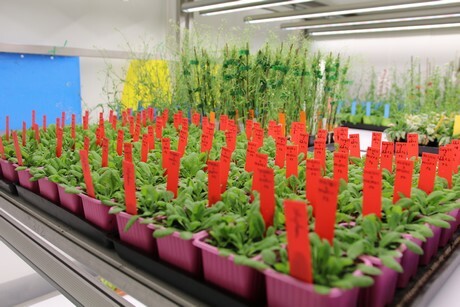 Valoya has conducted 514 plant trials to date and commercialized 6 spectra. This technology is protected through 86 patents and mostly unavailable publicly. It is imperative when buying a sunlight match, white LED light to not just buy it because it appears white but to also request research data from the lighting manufacturer. This data should include a description of conducted trials and results of them. Manufacturers may not want to disclose sensitive data on their technologies but they should be able to prove through trial data that their white LED light works and is superior to other market options. FIGURE 1: Fresh weight of Arabidopsis thaliana 30-38 days after sowing under 50 µmolm-2s-1 (top chart) and 200µmolm-2s-1 (bottom chart) intensity with spectra appearing white to human eyes. 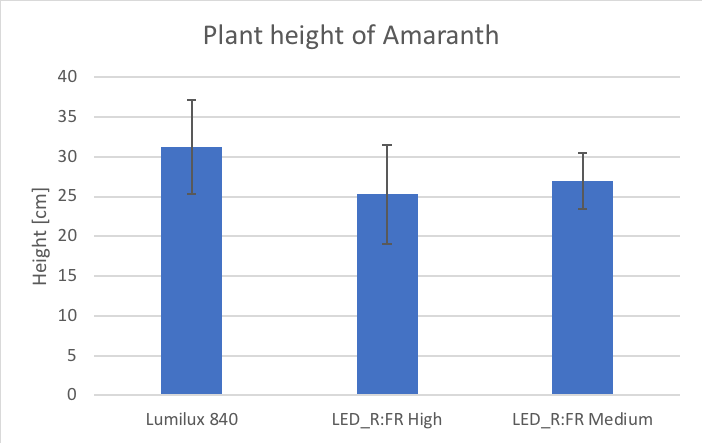 Light treatments consist of spectra created for human use (FL_840 and LEDs_CW), spectra adapted for plant growth (FL_Fluora, LED_R:FR Medium, LED_R:FR LOW) and a spectrum created to match outdoor/daylight conditions (LED_R:FR High). FIGURE 3: Effect of different spectra appearing white to human eyes on the morphological parameter of plant height. The measurement was taken 30 days after sowing of the Amaranth seedlings. Light treatments consist of a spectrum created for human use (FL_840), a spectrum adapted for plant growth (LED_R:FR Medium) and a spectrum created to match outdoor/daylight conditions (LED_R:FR High). FIGURE 4: Depending on the spectrum composition, spectra appearing white to human eyes affect the flower induction of Arabidopsis thaliana. Measurements were taken from 20 days after sowing until 38 days after sowing. Light treatments consist of a spectrum created for human use (FL_840), a spectrum adapted for plant growth (LED_R:FR Medium) and a spectrum created to match outdoor/daylight conditions (LED_R:FR High). Changes in plant morphology (figure 3) and plant development (figure 4) as well as protective responses are controlled by the spectrum. Spectra seen as the same by human eyes are seen differently by the plants. FIGURE 5: Different plants grown under Valoya daylight NS1 spectrum (200µmolm-2s-1). 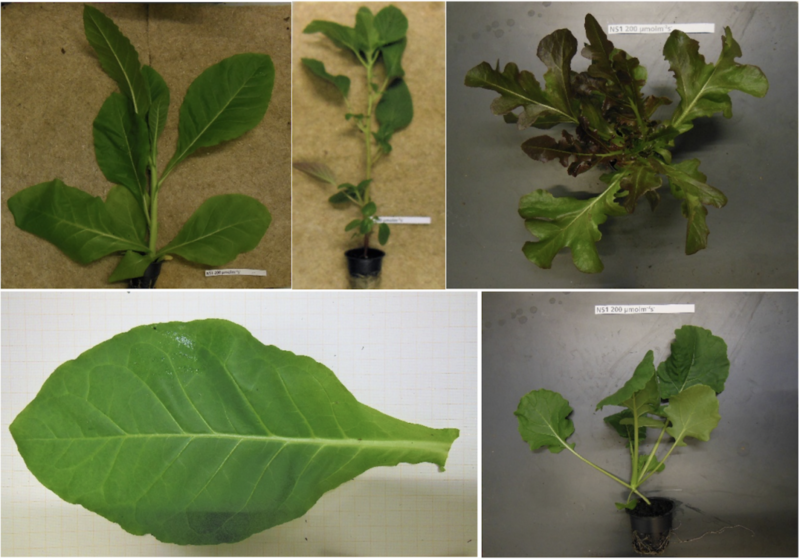 Plants from top left to bottom right: Nicothiana (Tobacco), Amaranthus (Amaranth), Lactuca sativa ‘Sadawi’ (Lettuce), leaf of Nicothiana (Tobacco) and Brassica napus (Canola). When it comes to studies on field crops in closed environments a sunlight or daylight spectrum is desired so as to provide the best possible match to light conditions available outdoors. A good sunlight match light will result in indoor grown phenotypes comparable to the outside ones. This was the reason for Valoya to design its NS1 spectrum which covers the needed wavelengths in the 380-780 nanometer range while excluding the wavelengths which do not benefits plants. This makes it a plant optimized, sunlight imitating light which is also a pleasant and safe white light. Due to it being a close sunlight match, the widest variety of plants and at all growth stages can be grown under it, indoors. The final important consideration when discussing white appearing LED light is its CRI (color rendering index) value. This is a measure of how realistically objects’ colors render underneath the light source and is measured on a scale from 0 to 100. The 0 value means that colors do not render realistically at all while 100 means that color render as realistically as they would under clear sunlight. In practice, this means that sunlight’s CRI is 100, indoor household illumination is typically 80-100 and street lighting is below 50, giving everything a yellowish hue. LED light can fall anywhere between 0 and 100 and Valoya’s luminaires have the highest CRI values in the horticultural LED industry (the NS1 spectrum’s CRI value is 90). This means the plans will look natural under them and visual inspection will be possible. More on this topic in the post: Why is LED Grow Light Purple? Valoya will be exhibiting at IPM 2019. To see the latest in LED grow light innovations, visit us at booth 3B42. Bantis, Filippos, Sonia Smirnakou, Theoharis Ouzounis, Athanasios Koukounaras, Nikolaos Ntagkas, and Kalliopi Radoglou. 2018. “Scientia Horticulturae Current Status and Recent Achievements in the Fi Eld of Horticulture with the Use of Light-Emitting Diodes ( LEDs ),” no. February. Demotes-Mainard, Sabine, Thomas Péron, Adrien Corot, Jessica Bertheloot, Jos?? José Le Gourrierec, Sandrine Pelleschi-Travier, Laurent Crespel, et al. 2016. “Plant Responses to Red and Far-Red Lights, Applications in Horticulture.” Environmental and Experimental Botany 121: 4–21. https://doi.org/10.1016/j.envexpbot.2015.05.010. Kami, Chitose, Séverine Lorrain, Patricia Hornitschek, and Christian Fankhauser. 2010. Light-Regulated Plant Growth and Development. Current Topics in Developmental Biology. First Edti. Vol. 91. Elsevier Inc. https://doi.org/10.1016/S0070-2153(10)91002-8. Olle, Margit, and Akvilė Viršilė. 2013. “The Effects of Light-Emitting Diode Lighting on Greenhouse Plant Growth and Quality,” no. April: 223–34.